No excuses. No apologies. No nonsense. We’ve been busy…really busy. The good news is that what we’ve been busy with is Monster Scenes. We’ve undertaken some endeavors that commanded so much attention, time, and investment. The good news, though, is that we’re coming out of the tunnel now and hope you’ll be excited about what we have to share. 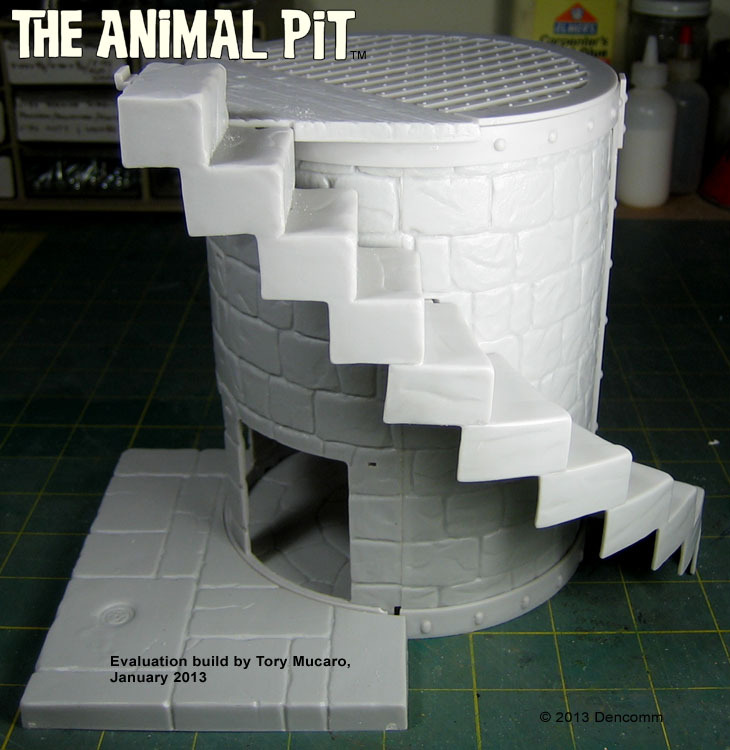 About the Animal Pit and the Dungeon — they’re still a “go” (albeit a slow go). Truly, we never anticipated the troubles we’d encounter after having acquired the original beryllium copper molds that Ferriot Brothers tooled for Aurora back in 1972. It seemed it would be an easy effort; secure the molds, make a few adjustments, and start shooting them full of styrene. Wrong! The history of these “lost” kits has continued on and yet we haven’t given up…and we don’t plan to. Andy Yanchus, original Aurora Project Manager behind Monster Scenes, knew these two complicated kits were going to be a challenge some four-plus decades ago, and he was right. Speaking of Andy Yanchus, there’s exciting news to share regarding a new book that tells the complete history of Monster Scenes. It’s a co-authorship between him and me, Dennis Prince (current Monster Scenes guy), and it has exceeded our expectations. We’ll post more information soon, telling you more about it and how you can get a copy. We’ll both be at Wonderfest 2014 this year (May 31 – June 1) and hope to see you there. 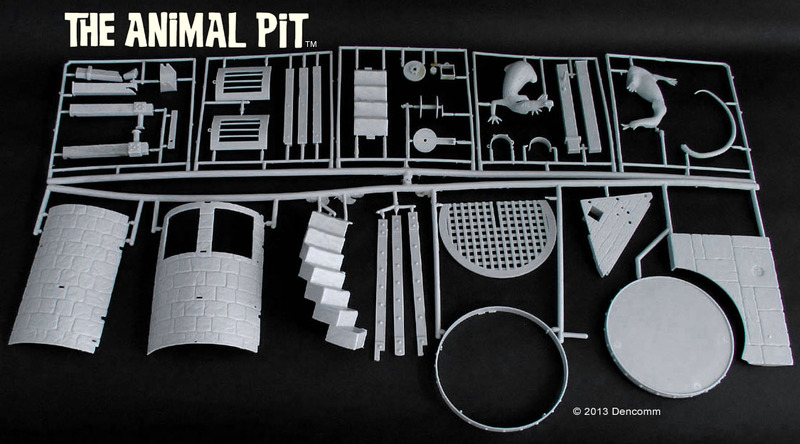 We’ll unveil the book and also provide all the details regarding the Animal Pit and the Dungeon kits. Yes, it’s been a long time since there has been fresh Monster Scenes information available for you. Thank you for your patience and your support. We hope you’ll find that the wait has been worth it. Here are a few photos of his results so far (you can click on each for a larger view). 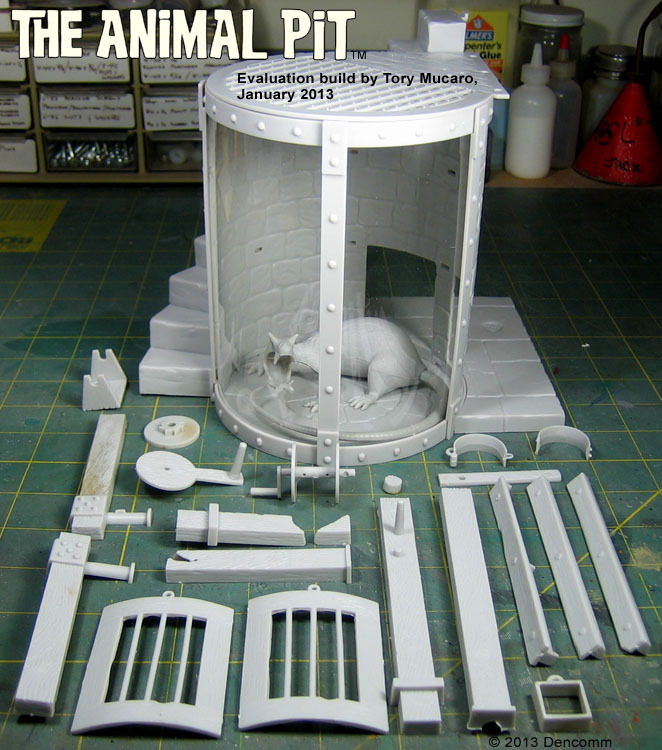 Even though this is a somewhat complex kit – quite a feat of imaginative engineering, really – Tory reports the build has gone surprisingly well considering these molds were never 100% finalized before Aurora pulled the plug on the series. Tory’s bona fide linneage to Aurora gives him unique insight on this particular project, bringing up a potential for us to ponder – there’s historical value in releasing these kits in a limited fashion as they are now, allowing delivery and preservation of a true time capsule or “holy grail” (as some call it) before doing any modifications to the original tooling. We agree with Tory that this is a rare occasion. And, as Andy Yanchus confirmed, these are one-of-a-kind molds since Aurora didn’t create any duplicate tooling for these kits as they did with many of their other models. 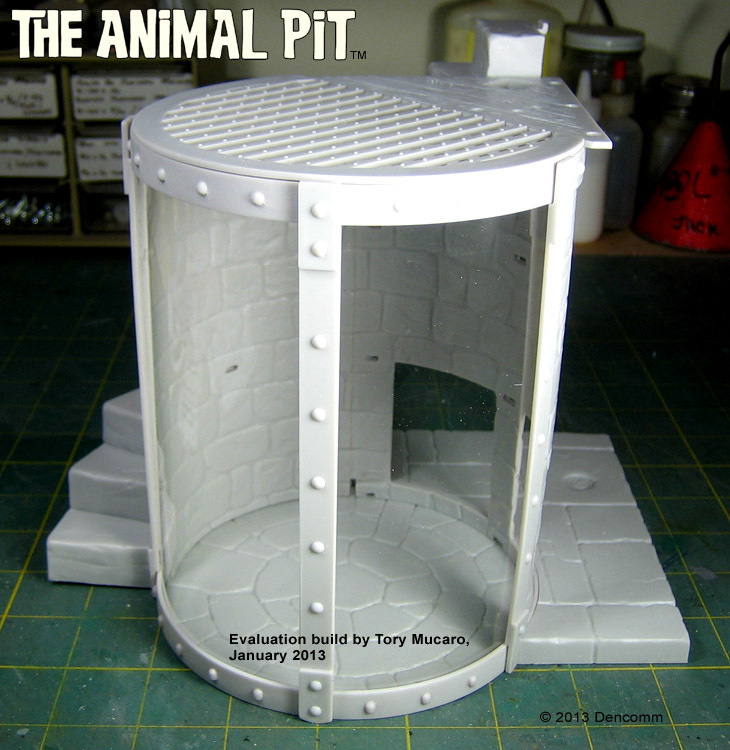 We’ll post more updates to Tory’s progress on the Animal Pit and, soon, the Dungeon. For now, we’re grateful to have him working with us on this project. We couldn’t have asked for a more apt individual for this effort. Hey there Monster Scenes enthusiasts. Sorry for the lapse in communication here. No, we weren’t detained in Dr. Deadly’s dungeon — 2012 was just one of those years that seemed to end too quickly. The good news is we’ve been hard at work on several new Monster Scenes projects in that time. The outlook for 2013 looks good and we’ll soon share what we’ve been up to. 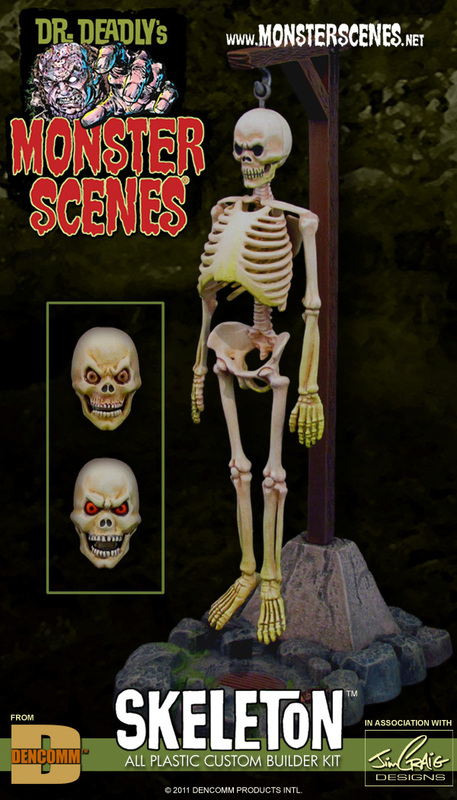 In the meantime, we’ve added a few new products to the Gruesome Goodies Store at www.MonsterScenes.net. 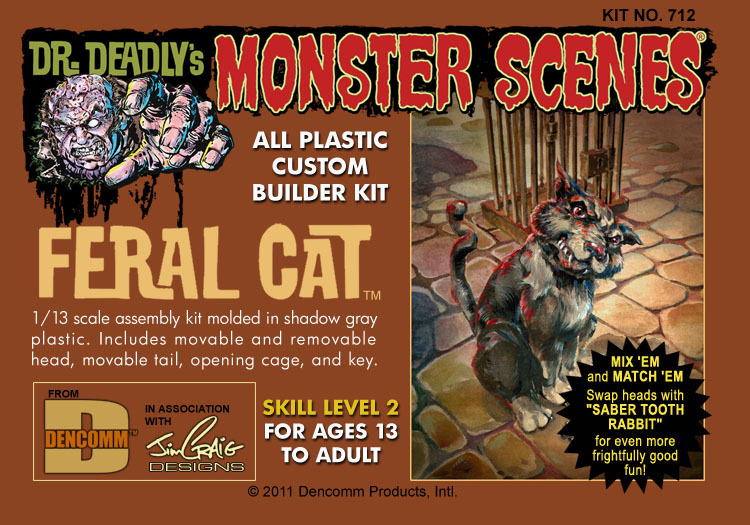 Most notable is that we’ve made the Saber Tooth Rabbit, Feral Cat, and Skeleton kits available for direct purchase. Though they’ve been available at many brick-and-mortar and online retailers, some of you contacted us to say you still couldn’t find them. Fret no more – you can buy them now at the MonsterScenes.net site. 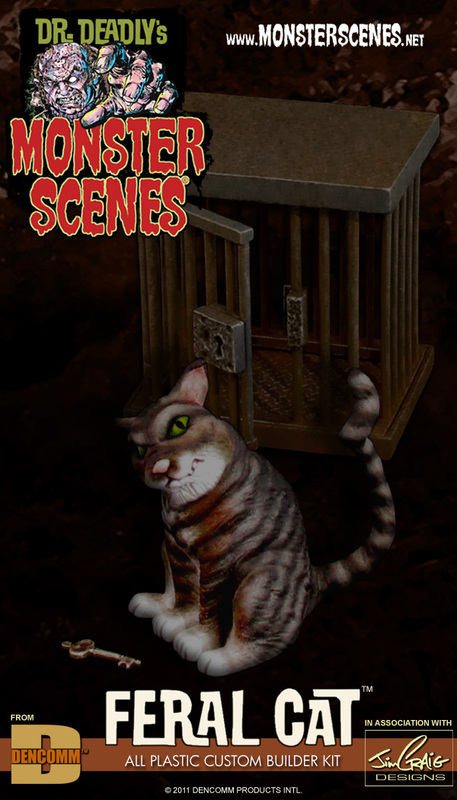 Watch for more information about our other projects coming soon to the Monster Scenes Journal. 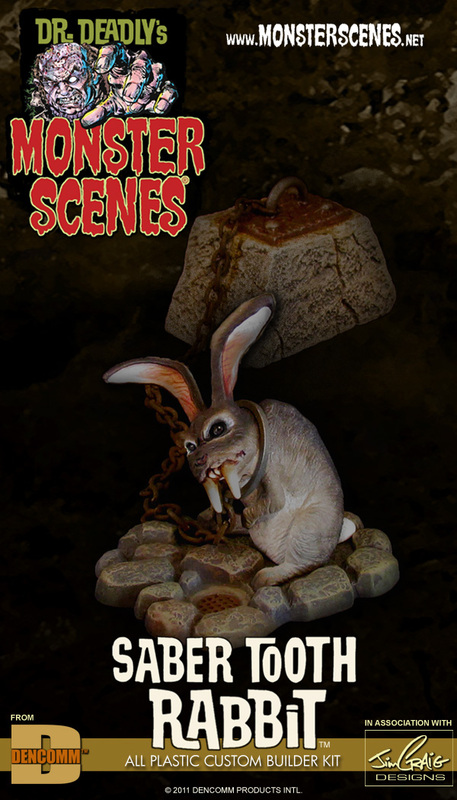 You better watch out: the new Monster Scenes kits have arrived! They’re here! 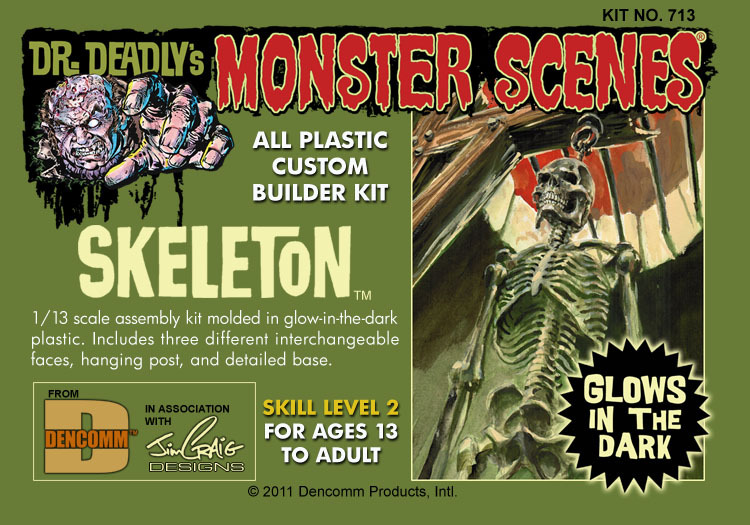 The first wave of Dr. Deadly’s Monster Scenes kits have arrived. 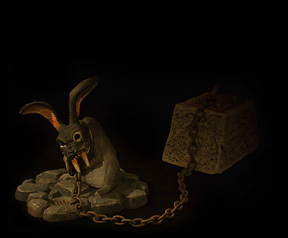 Now you can get the Saber Tooth Rabbit, the Feral Cat, and the Skeleton. 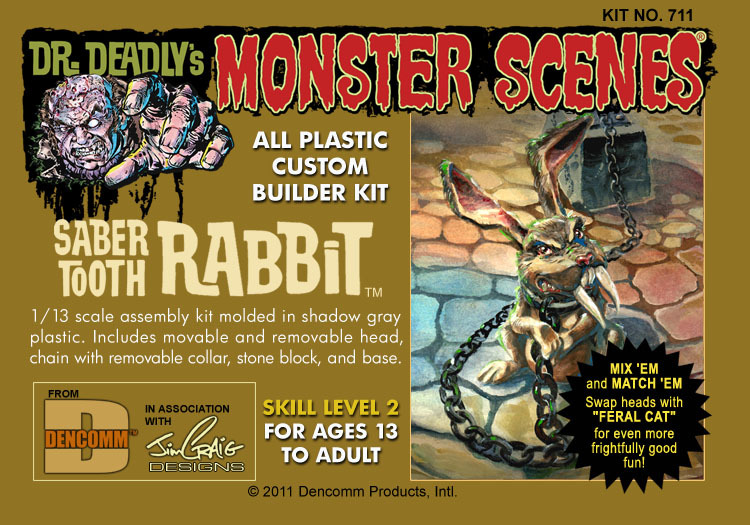 Each easy-to-assemble kit is molded in styrene plastic and each includes a color mini-comic and pin-up poster, both illustrated by Jim Craig. Look for these kits at your favorite hobby retailer. And, don’t forget that you can easily order online from MegaHobby.com. Get yours today. 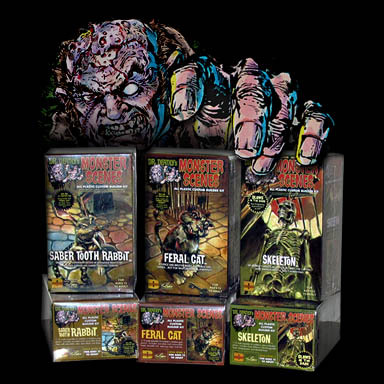 A few days ago we posted a note on our Facebook page to let folks know we’re moving out our Classic Monster Scenes collectibles to make room for the new kits that are coming soon. We’re posting that same information here just in case you didn’t see the update. 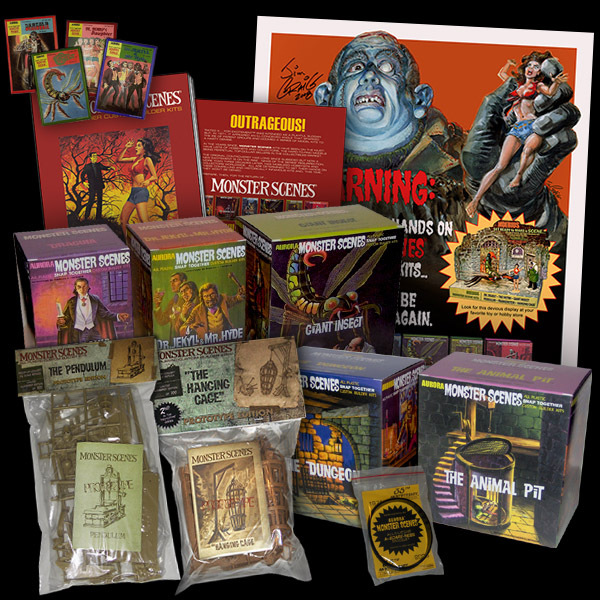 Visit the Gruesome Goodies Store and save 50% on our remaining inventory of limited edition collectibles. The quality of these items is high, the prices are low, and supplies are limited.